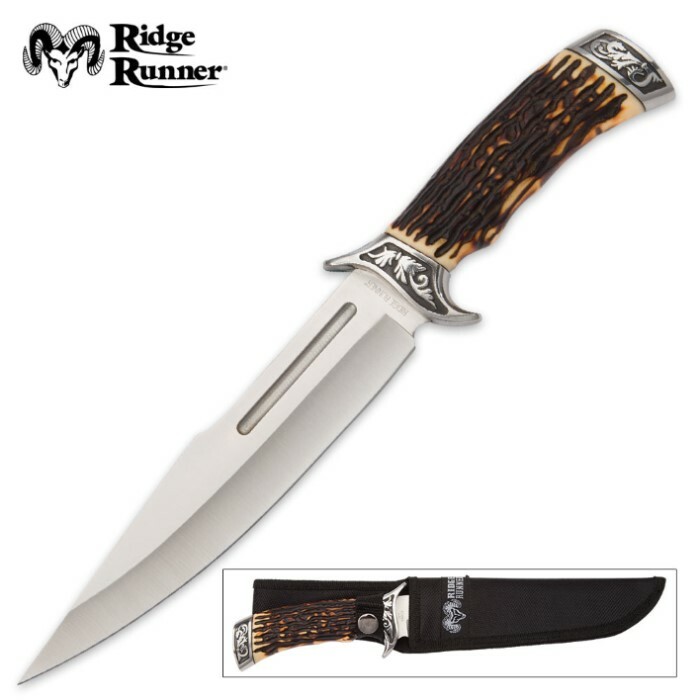 Ridge Runner Pronghorn Prairie Bowie Knife and Sheath - Faux Stag Antler Handle - Deer Hunting Knife | BUDK.com - Knives & Swords At The Lowest Prices! From the display case to "where the deer and the antelope play," Ridge Runner's surprisingly affordable Pronghorn Prairie Bowie stands apart from the rest - even among fixed blade knives priced two and three times its cost! With its rugged beauty and solid construction, it's perfect for the budget conscious consumer who needs a dependable fixed blade for outdoor adventures with the look and feel - but not the price - of a traditional staghorn bowie. 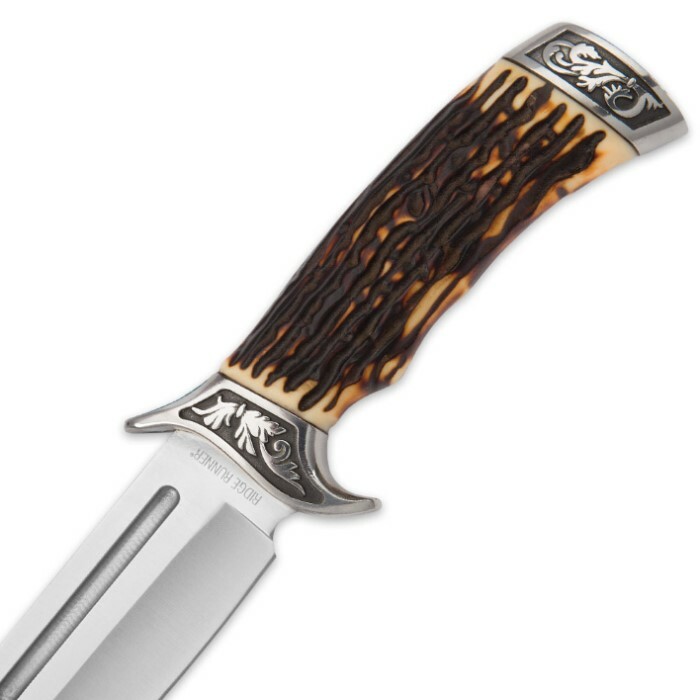 The Pronghorn Prairie's advanced polymer handle is carefully molded and painstakingly painted to mirror jigged antler, and the results are spectacular! Only the most scrupulous observers will be able to tell the difference between the Pronghorn Prairie's synthetic staghorn and the genuine article. It's every bit a strong as authentic antler, and with its ergonomic form and delightful texture, the Pronghorn Prairie's handle boasts a remarkably comfortable hand-feel that's arguably better than the real thing! The handle is bookended by stainless steel guard and pommel, both accented with charming floral relief patterns. Their mirroresque gleam beautifully offsets the 420 stainless steel blade's alluring satin finish. At 7 3/8" long, the versatile blade is ideally sized for simple everyday cutting jobs around the home or farm, rigorous chores in remote back country and everything in between. Its fierce modified clip point profile is great for slicing, skinning, cleaving and even light chopping. Thanks to its comfortable 12" overall length and the included heavy duty nylon belt sheath, the Pronghorn Prairie is easy to wield and transport in the field. Its undeniably handsome design makes it equally well suited to display. Regardless of how or where you use it and in spite of its impossibly affordable price, rest assured the Ridge Runner Pronghorn Prairie Bowie Knife is built to last - a quality fixed blade you can count on to get the job done and look good doing it. The first time. Every time. Got this bad boy from KOTM, and am as happy with it as can be! Looks gorgeous, and I love the handle design. This is One Fantastic Looking Knife,Feels Tough,Looks Nostalgic, Extremely Sharp Right Out of Box.An Excellent Price.Very Happy With Purchase. I am very happy I bought this knife. The blade is sharp. The handle feels good in my hand. It cuts great. I have been cutting small branches with one slice. It is very easy to sharpen to a very sharp edge. The handle looks nice Evan though it is not real stag,it looks like it. For 10 bucks this is great deal. This is a good knife,especially for the price. I bought two of them and I'm glad that I did. This knife is cool. The handle looks and feels great, even if it is plastic. The blade is very sharp and the spear point is perfect for piercing right through things. At this price, everyone should get it. Thanks BudK! This thing has a wicked point .Comes sharp right out of the box with a little work it is scary sharp .12 inches long overall with a 71/4 inch cutting edge . Ridge Runner has doe it again . Sheath is not that great but will work until I find a better one . 100% satisfied . Would buy again .